Now you can carry around some of the most iconic items and images from the Harry Potter series with you at all times! 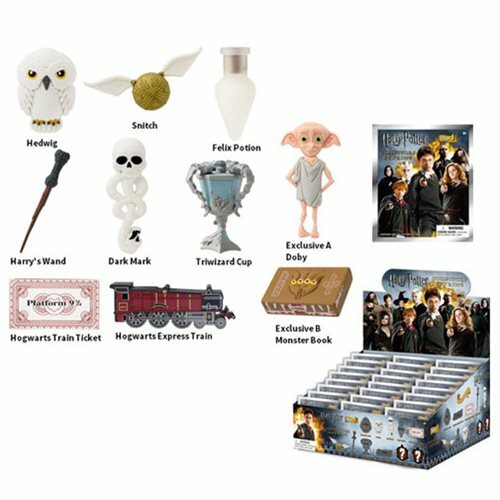 This Harry Potter 3-D Figural Key Chain 6-Pack contains 6 individually packaged foam key chains, and you could get Harry's owl Hedwig, the Golden Snitch, the Felix luck potion, Harry's wand, Voldemort's Dark Mark, the Triwizard Cup, a ticket for Platform 9 3/4, the Hogwarts Express Train, the Monster Book of Monsters, and even a rare chase version of Dobby the house elf! Ages 4 and up. This Harry Potter 3-D Figural Foam Key Chain 6-Pack contains 6 individually packaged key chains (subject to change).